Bass PC Pal Hand Painted Durable Poly-resin Construction by Rivers Edge Products - Copyright 2005 Measures approx: 3 1/2" wide x 3 1/4" high This PC Pal is tough and colorful. Express your desire to fish or simply go for a smile, they're just plain fun! Easy to Apply, Peel and Stick on a clean, solid surface. 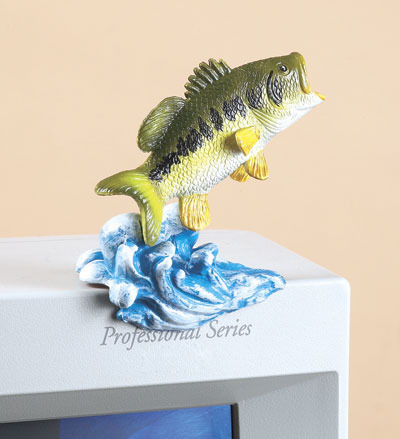 Mounts easily on top of your Computer Screen, Refrigerator, TV or similar surfaces. A great gift for any fisherman on your list! New, in Sealed Package!